An internationally respected economist and financier MOHAMED EL-ERIAN has experience at the highest level of business and government. A go-to voice on how to decode international markets and the global economy, El-Erian dives into how global trends from technological advancements to geopolitical developments could impact market stability. His BloombergOpinion column, regularly makes headlines thanks to El-Erian's spot-on and substantive analysis, and in recent weeks he has been sought-out for his shrewd analysis on CNN, CNBC, FOXBusiness, Bloomberg, and more. Consistently heralded as a smash-hit with audiences worldwide, he has been an in-demand speaker everywhere from The World Economic Forum and LinkedIn to the SALT Conference and CME Group. Selected to address 1,000 asset managers and investors at the upcoming 2019 Context Summits. Having made headlines for his analysis and keynote at the 2017 Barclays Asia Forum, El-Erian has already been sought-out for the 2018 Barclays Asia Forum in Singapore. El-Erian recently made headlines due to his appointment as a new member of Under Armour's Board of Directors. As Under Armour's Chairman and CEO said, "Mohamed's renowned international, macroeconomic and financial expertise are welcomed strengths as we lean even more deeply into our transformation..."
A prolific writer, El-Erian has recently penned influential op-eds on Turkey's economy for Project Syndicate, what to expect from the Fed on Bloomberg, and international trade turmoil on The Hill. A New York Times betselling author, El-Erian's #1 Bestseller The Only Game In Town provides a roadmap to what lies ahead and the decisions we must make now to stave off the next global economic and financial crisis. 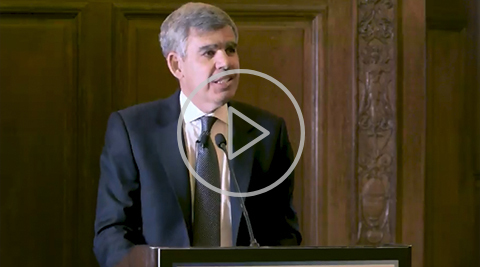 A leading, go-to voice on the global economy, Mohamed El-Erian balances substantive insights with engaging anecdotes at each of his events, providing audiences with an unforgettable experience.